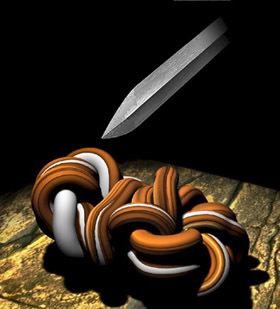 “An intractable problem solved with a bold stroke” – Legend has it the untie-able Gordian knot, an ancient riddle, was solved by one of history’s iconic leaders, Alexander the Great. At just 30 years of age Alexander the Great commanded one of the largest empire’s in ancient history, stretching from the Ionian Sea on the west coast of Greece to the Himalayas. Taught by Aristotle in his formative years, Alexander remained undefeated in battle from his ascendency to the throne at the age of 20, until his death from fever at just 32. Alexander is widely considered one of history’s greatest commanders and leaders. The intricate knot was originally tied to an ox cart in Gordium, and Alexander attempted to unbind it while wintering there from his battles. Unable to find the ends to the knot (and I’m guessing due to some frustration) he sliced it in half with his sword producing the required ends – the Alexandrian solution. Alexander’s biographers suggest, retrospectively, that the legend of the Gordian knot was the one to untie it would become the king of Asia, as Alexander went on to lay claim to. Mythology aside, we are often faced with examples of Gordian knots in our business lives. Like a business plan that seems to go around on itself without leading us forward, or an involved agenda without a clear start or end, perhaps being bound up in internal meetings without a clear direction. While it would be nice to think that the solution to problems such as these was the Alexandrian one, i.e. walk in, deliver a bold stroke, watch the results flow; the reality is that the bold stroke in modern business must be structured, and begins with the right business strategy. A clear, concise and communicable strategy can have intricate pieces, should be tied to all parts of the business, and will be measurable. Most importantly though, it’s starting point will outline the possibilities, and its end point will deliver results. It will be a visible stroke through the business, and while we may inevitably get caught up in the day to day intricacy of what it takes to run a modern business we should continually look to our strategy to give us the possibilities of where we want to be, and the execution we need to perform, for the results we need to achieve our goals. Good strategy is a bold stroke that can solve the intractable problem, and lead to great things. © 2011 521 Group. All Rights Reserved. It’s so much more than taking the payment. Is your Strategy really just a plan? In payments, everything is changing…and staying the same.